Modern, fun and luxurious, SLS Las Vegas Hotel & Casino at the north end of the Strip offers a unique, boutique hotel experience. Offering easy access to top Strip attractions, located just a few blocks down the bustling Las Vegas Boulevard, SLS Las Vegas Hotel & Casino provides a vibrant Las Vegas experience at an exceptional value. The hotel location allows for convenient access to McCarran International Airport, direct access to the Las Vegas Convention Center via the pedestrian air bridge and easy access to the Las Vegas Strip with direct access to the Monorail. 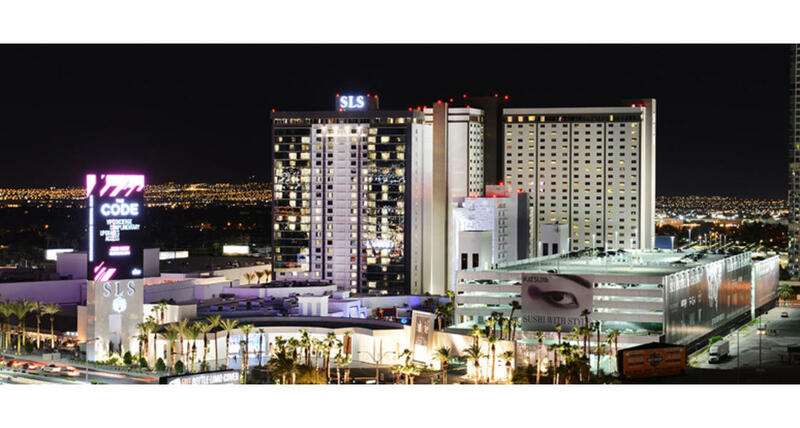 SLS Las Vegas Hotel & Casino houses over 1,600 stylish accommodations, ranging from chic rooms to opulent suites, in two distinct towers: the World Tower and the Story Tower. Guests can enjoy the resort-style Foxtail Pool as well as receive 24/7 access Fitness Studio. SLS Las Vegas features several restaurants, including Bazaar Meat by José Andrés™; Cleo®; Umami Burger, Beer Garden & Sports Book; 800 Degrees Neapolitan Pizzeria; Northside Café & Chinese Kitchen; and The Perq™. Additionally, SLS Las Vegas Hotel & Casino is home to a nearly 60,000-square-foot casino as well as a sports book operated by global gaming leader, William Hill.